The MRI Cleaning Wand is a non-magnetic tool designed specifically to clean and disinfect both MRI and CAT scan machines. Finally, hospitals and clinics will be able to easily clean between patients without losing valuable scanning time. The MRI cleaning wand reaches inside the MRI magnet bore or CAT scan gantry to clean and disinfect those difficult to reach places in seconds. 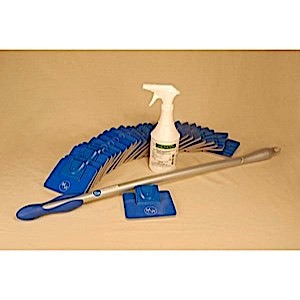 The MRI Cleaning Wand's specifically designed disposable pads can be used with any spray disinfectant or cleaning solution. Once the area of interested has been cleaned and disinfected, simply eject the disposable pad without touching it with your hands, eliminating the risk of further contamination. The MRI Cleaning Wand is a dynamic idea intended to make the radiology are a safer, cleaner and more enjoyable environment to work and stay in. Initially designed to be used exclusively in the MRI bore and PET scanner tunnel, it is also recommended for CAT scanner areas, X RAY units, or any radiology equipment where patients are scanned routinely every day. The MRI Cleaning Wands is for mild cleaning and disinfecting. If an area is suspected of heavy dirt and excessive blood where the possibility of strong bacterial contamination is suspected, a cleaning company should be used.